The Glorious Bronze Tabernacle is made of high-quality bronze and has a Gothic style that's beautifully detailed. The piece has an unusual rounded shape with details that span the circumference of the design. 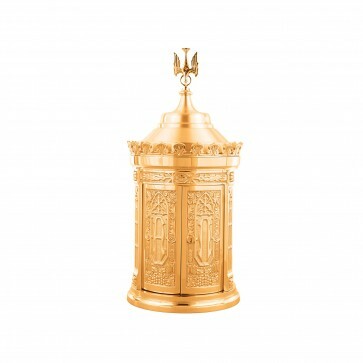 The tabernacle is either available in high polish or satin finish and comes in several sizes. The highly ornamented double action doors are available with artistic painting, if desired. The finish is oven baked for durability and they interior is lined with white fabric in a traditional style. A simple base and finial adornment complete the design.